While photographing some items soon to hit my Etsy shop, I decided for an impromptu shoot of another kind. Some of you may remember my dear sister Ashley buying me my very own Blythe doll for my birthday back in May? Well after a bit of searching on Etsy and eBay, I found some lovely little props for her. And since I've been working with creepy dolls, I've decided that it's high time for something cute. 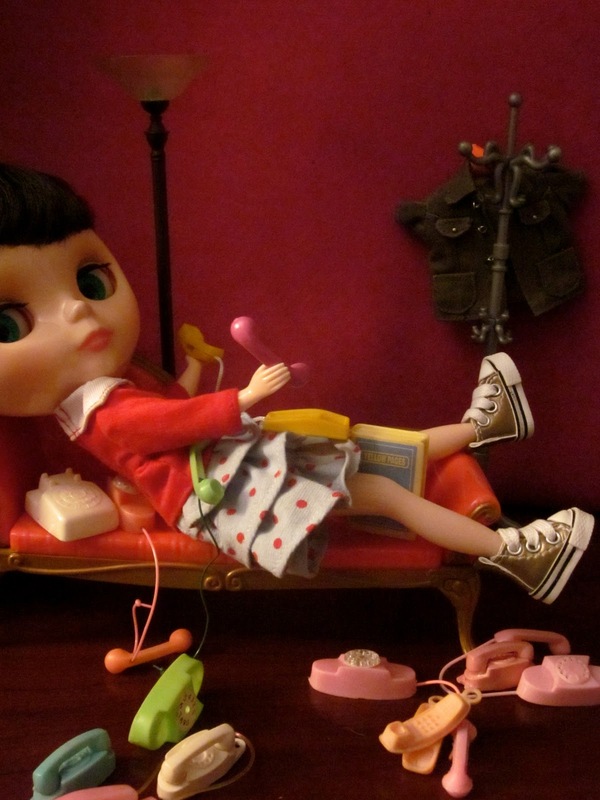 So please welcome Blythe in her first professional photo shoot. This is Blythe. And she's terribly busy! Don't you love that little outfit? The red sailor shirt and polka dot skirt were bought on consignment from the official Blythe website. And yes, those are teeny, tiny little gold Converse shoes! 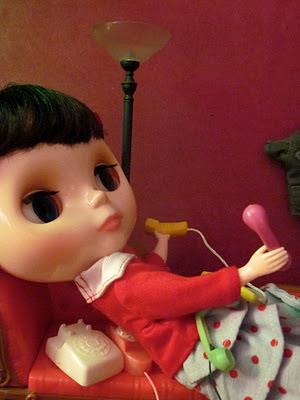 The vintage Barbie telephones were found on Etsy and the lovely little sofa, lamp and coat rack were found on eBay. I wish my local thrifts would start sprouting up all the vintage Barbie clothes and props I could use for future Blythe shoots. But either no one is donating them or all these goodies just aren't making it to the sales floor. Because all I seem to find are naked, knotted hair Barbie dolls. I guess this just serves to say that while the random miscellany of the thrift offers a lot of mystery and some big payoffs, it's nice to know that anything you ever could want is online. Until next time, happy thrifting...and online bargain hunting! Thanks, Van. I loved staging that shoot, all those teeny, tiny phones. Can't wait to see your little doll and miniature photos! Thanks, Megan! 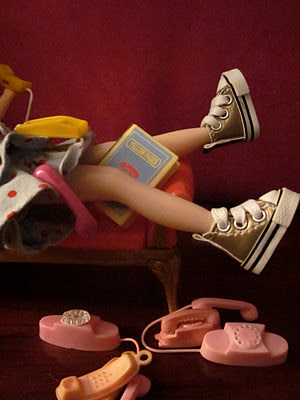 I loved shooting this...except when the teeny, tiny telephones refused to stay put. That part was a teeny, tiny pain in the rear. Ha.